Many Courserians have been asking about how Verified Certificates and shareable course records work. We hope this helps! Verified Certificates are a currency for your lifelong learning achievements. With Verified Certificates, you receive official recognition from world renowned institution for successfully completing a course on Coursera. Remember that a Verified Certificate does not include credit towards a degree, nor does it make you a student at the respective university. It does however prove you’ve mastered the material in your rigorous and thorough course. The Verified Certificate has plenty of nifty features that help you share your accomplishment, like the Verify URL. Anyone you share your certificate with can validate its authenticity directly on Coursera by visitintg this URL “coursera.org/verify/your_verification_code” in the lower right-hand corner of your Verified Certificate. When someone’s visits this URL, the page will confirm the authenticity of your Certificate and share more about the course’s syllabus and workload. 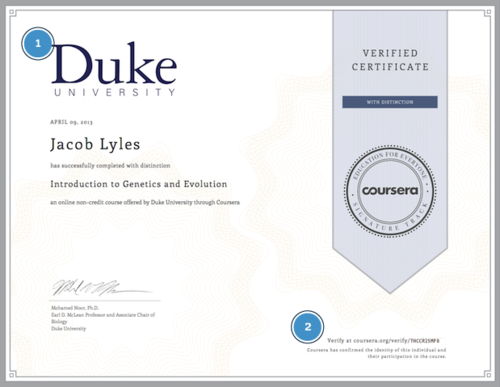 See a Verify URL for our Engineer Jacob’s recently completely Duke course! You can share your complete course performance with anyone you choose. 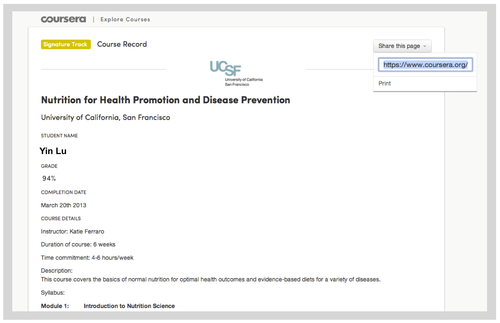 To access this page, login and go to your name in the upper right hand corner of your Coursera page. 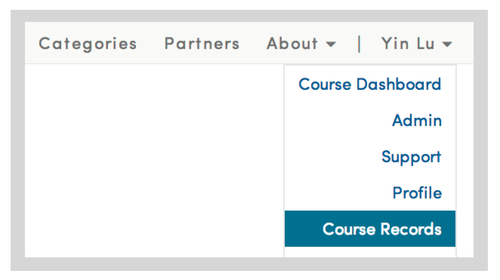 Find “Course Records” and click on it. Like the Verify URL, this page is reachable via a URL unique to you. However, unlike the Verify URL, this page also displays your final course score. Anyone you share your Course Records URL with can visit this page to see summary of the course format and assignments and your detailed performance. It is easy to control who can access this url and you can reset it anytime too! We encourage you to share your Verify Certificate URL and Course Records Page. How can I earn a Verified Certificate? You can earn a Verified Certificate by joining Signature Track for an eligible course. Signature Track securely links your work to your real identity using your photo and unique typing pattern. Eligible courses starting this week include Introduction to Operations Management and Design: Creation of Artifacts in Society, both from University of Pennsylvania, and Citizenship and U.S. Immigration from Emory University. You can always see a full list in our course catalog!